Perth Vet Emergency is an emergency and critical care hospital for small animals. Our team of emergency veterinarians and nurses are here 24 hours to help both you and your pet when you most need them. We’re available to offer veterinary treatment to all companion animals when their General Practitioner is closed. No appointment is necessary. We see all pets as fast as we can in priority of the severity of their injury or illness. The most critical patients must be seen as a priority. If your pet is critical, please contact us prior to your arrival so we’re adequately prepared. Due to the nature of our speciality, we do not provide vaccinations, microchipping, non-emergency desexing or treatments that can be scheduled with your pet’s GP. If you would like more information about caring for your pets, please have a chat to our friendly staff about the PVE First Aid Book available for purchase. Our Vision – We seek to set the highest possible standard for Emergency and Critical Care veterinary medicine in Australia. Our Mission – We provide high quality emergency and critical care services for small animals, whilst maintaining a close relationship with their general practice veterinarians. Our specialised team strives to provide a friendly, compassionate and helpful experience. When should you visit our pet hospital? You know your pet better than anyone and you should trust your instincts if you suspect your pet isn’t well. The Perth Vet Emergency recommends you seek professional help from your general practitioner or call directly the Perth Veterinary Emergency. Some common signs of illness include vomiting, diarrhea, no appetite, lethargy, or sleepiness. Urgent problems are not limited to but can include breathing difficulty, a swollen tummy, choking, unconsciousness, seizures or discomfort. If in doubt, it’s always best to have your pet assessed; even if only for reassurance that they are OK.
Feel free to call the Perth Vet Emergency Clinic during the day or after hours to speak to one of our friendly staff. Many pets suffer injuries and illness at times when local vet clinics are closed. At Perth Vet Emergency, we are dedicated to filling those gaps when regular veterinary care is unavailable. We are the trusted after hours vet professionals in Perth. If your pet ever needs emergency vet care, they can find it with us. Our veterinary clinic stay open all night to provide the highest standard of care for animals when they need it. At the same time, our staff provides reassurance and general advice to pet and animal lovers seeking help. We stay awake all night so our professional colleagues can develop a balance between their demanding work commitments and their personal life. We do this because we are a team of professionals dedicated to accomplishing our goals and advancing the discipline of Veterinary Emergency and Critical Care. Our experienced team provides emergency veterinary services in Perth. As highly experienced professionals, we aim to give local pet owners peace of mind knowing our pet hospital is nearby to assist with anything they may need regardless of the time of day or night. Specialising in emergency and critical care, we fully assess your sick or injured pet and provide them with the best treatment plan for their specific ailment. 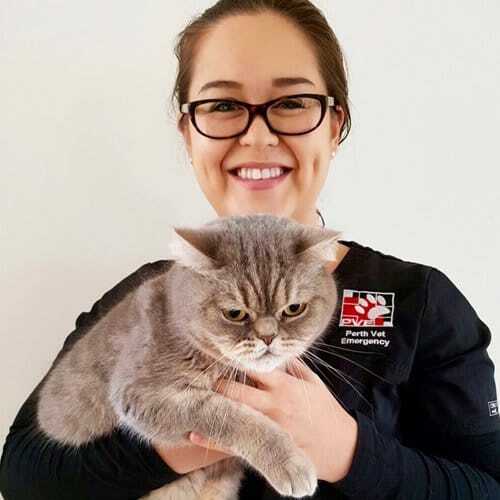 This personalised service is exactly what you can expect to receive from our team of dedicated staff upon visiting a Perth Vet Emergency clinic.